When someone says Spanish Cuisine the first dish that comes to nearly everyone’s mind is Paella. And yes, you can find Paella in virtually every city, village and taberna. Historically, Spain was divided into small kingdoms; each one with its own language, culture and cuisine. Today, Spain is divided into 17 Autonomous Communities, each one with its own unique cuisine. Valencia, in Eastern Spain, is the undisputed home of paella. It is one of the largest natural ports in the Mediterranean and has been one of the most important rice-producing areas in Spain since rice was introduced by the Moors over 1200 years ago. Paella has ancient roots, but its modern form originated in the mid-19th century near the Albufera lagoon on the east coast of Spain adjacent to the city of Valencia. Although many people regard Paella as the national dish of Spain, Valencian’s regard paella as more than just a dish – it is also one of their most identifying symbols. There are as many different Paella recipes as there are Spanish Mothers and Chefs. Paella de Marisco (seafood), Paella de Verduras (Vegetarian), Paella Mixta (freestyle) and Paella Valencia are the most common dishes. 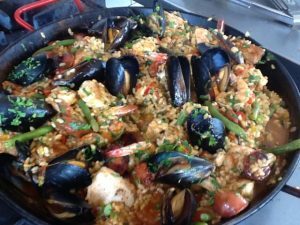 Paella Valencia traditional will be served with short grain rice, green beans, snails, chicken or rabbit, chorizo and of course Saffron and Pimenton de la Vera. Below is my Paella Recipe, and like I said, every Paella recipe is different. Mine is unusual in that I cook the delicate fish separately from the rice, because I want the fish to be as fresh and light as possible. Pairing with Paella is easy – a lighter white like Albarino or Verdejo or a softer red like Rioja or many of the great Garnacha (Grenache) Spain has to offer. Today, I am pleased to show a new one we just discovered – a beautiful and affordable red made from 120 year old vine Garnacha from Navarra. In the twelfth century, the Cistercian monks of the Monastery of Fitero planted their first vines of Grenache and began the preparation of a unique and exceptional wine. Rafael Reverte has recovered Pie Franco vineyard planted in 1899, before the step of Phylloxera, to produce a wine of legend within reach of very few: “Cistum”. Taste Lenny’s Paella Wednesday April 5th 6 pm with Special Guest Victor Palencia of Palencia Winery! The post Weekend Wine Pairing Paella Valencia + Cistum Granacha appeared first on Madewine's Sippy Cup - Blog. 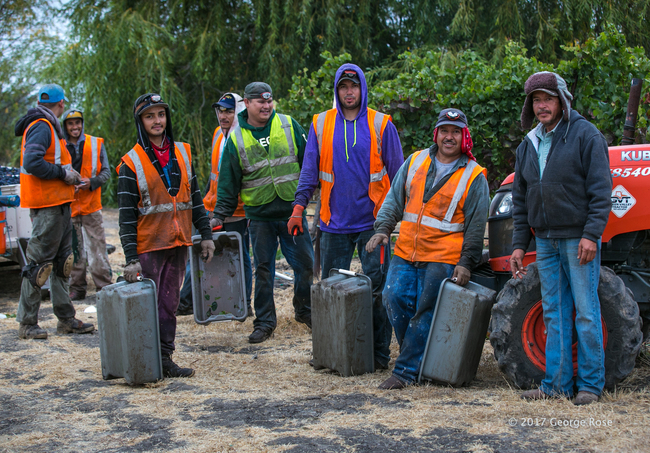 SONOMA, CA: A vineyard crew takes a break after pulling an all-nighter at Sangiacomo Vineyard in Carneros near Sonoma, California. All over California wine country, concerns are being raised about the potential impact of the Trump administration's policies on vineyard labor. Fine art prints of this image and others are available at George Rose's web site: www.georgerose.com. To purchase copies of George's photos for editorial, web, or advertising use, please contact Getty Images. Vinography regularly features images by photographer George Rose for readers' personal use as desktop backgrounds or screen savers. We hope you enjoy them. Please respect the copyright on these images. These images are not to be reposted on any web site or blog without the express permission of the photographer. My brother introduced me to it in 2007. It clicked with all of my interests. I took the most roundabout way to get into wine. I bounced around trying to find that path. I was a cellar rat and lucky to be mentored by some very good winemakers at Gramercy Cellars in Walla Walla. I wanted to expand my experience and work in proper cool-climate winegrowing, so I went to New Zealand for a short stint. That stint quickly grew into six years and Marlborough has become my home. It is on the margin of winegrowing in New Zealand. It is challenging, but when it works, the wine is great. And it’s always unique. I also love the proximity to the Wairau River for personal, fish-related reasons. Our wines should clearly reflect our site. We spend so much time working on the fruit that it is important that it is showcased. My job is to bring out the best of that fruit in the wines. It’s funny because that usually means doing the work in the vineyard so that we do as little winemaking as possible in the winery. What other profession works that way? Our vineyards can be very challenging. We have this tense relationship with nature there – it is our friend, but also our enemy when the weather turns against us. We try to be the most responsible caretakers of the land and to help the vines find a happy balance. I would also say that it is a massive challenge to stand out in today’s global wine market. I have to name-drop my own brother, Brandon Kubrock, at Ardor Cellars. He has worked so hard to get where he is and is truly a self-made talent. If you get a chance to taste his wines you will not be disappointed. There are a lot of other winemakers I greatly respect. In general, they are those that see the trends and the market research, but tend to make wines that are respectful of the vines and the land. They make wine that they love to drink from special, unique places. I am seeing a whole new wave of young winemakers across the U.S. bringing wine back into balance. Wine doesn’t have to be overextracted, overripe, overoaked, and overalcoholic. At a time when the American palate seems to be craving big, sweet, overblown wines, it is great to see the new wave focus on lower alcohol, finesse, acid, and texture. I see this in wines from all over CA, WA, and even NY. Shoot, I recently read a piece from Jancis Robinson about Aussie winemakers surfing this wave. Walla Walla and Cote-Rotie. There are great wines that I enjoy from all over the world, but whenever I am drinking from WW or CR, I get pretty excited. You know I’m pumped about it when I can’t wait to share it with you. I recall two wines from the same vintage pretty clearly. Didier Dagueneau 2007 Silex – we drank it after my brother’s wedding and I was blown away. Also from 2007, I loved the Chateau d’Ampuis from Guigal. Our cellar is pretty young. I have a couple of early 90s Aussie Cabs. It’s also a pretty inexpensive cellar – so much great wine out there at less than $75 that I struggle to spend more. I think the priciest bottle is probably ‘15 Donnhoff NH GG. 2014 Art Den Hoed Syrah from Ardor Cellars in Walla Walla. Tough call. I’m on a bit of a Riesling kick at the moment. But I would probably say Pinot Noir and Chardonnay because of their range. Let’s not get crazy here. I think this is more of a both/and situation than an either/or one. I love adventuring around the South Island with my fiancée. We often find ourselves fishing or hiking somewhere. OK, so I fish and she patiently supports me. We also tend to find ourselves barbecuing with friends. I am a pretty open book. Before I discovered wine,I was about to go back to school to study engineering. I think it is a good measure of success when the people around you and on your team are growing and succeeding. vinNebraska, a local organization with a passion for wines, is hosting the annual grand wine tasting and silent auction this weekend. A portion of the proceeds will go toward providing programs for students with Partnership 4 Kids.